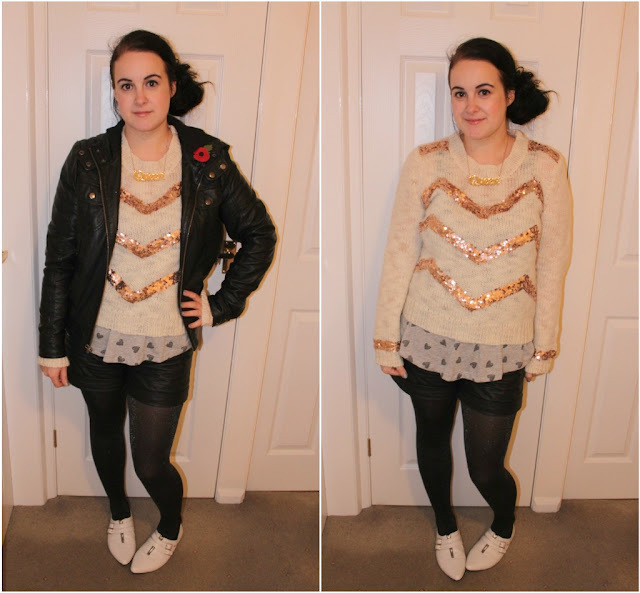 Outfit Post: Trick or treat? Firstly, apologies for the horrible lighting in these photographs. Going to work in the dark and getting home from work in the dark limits my ability to get decent outfit shots! 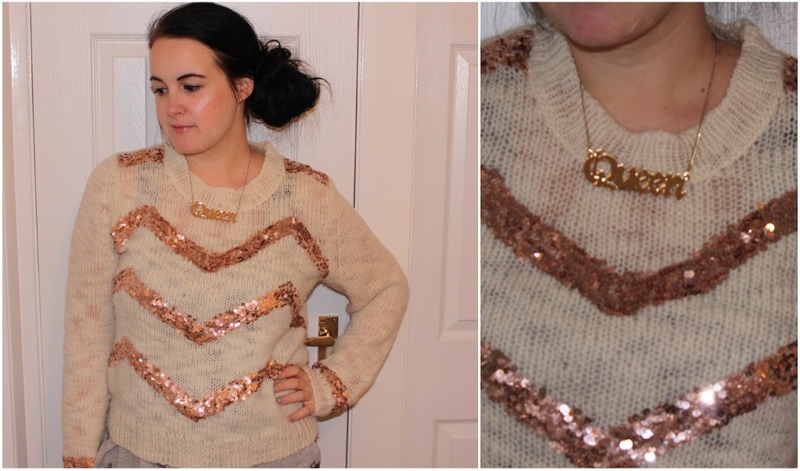 Let me introduce you to my Christmas jumper! The minute I saw it in Topshop I was smitten. Sequins, soft cream wool and a zig zag pattern. Sold! It looks so festive and I am all about the festive. I did a little squeal yesterday in Marks & Spencer when I saw the Turkey Feast sandwich. Best. Sandwich. Ever. Don't even get me started on the gingerbread lattes and red cups at Starbucks. Let me just say that this jumper was far more expensive than it should really have been. But it's testament to my love for it that I didn't even think twice before flinging it at the till and handing over my credit card. The 'Queen' necklace was a birthday present from my gorgeous friend Sammy. A bit of birthday Tatty! What could be better? I wish this photograph did this nail varnish more justice. In reality it's a gorgeous shimmery blue colour that looks green when in the light. A bit holographic and bloody lovely! At the moment I seem to be inexplicably drawn to pointy flats. The Office sale is like my crack as, invariably, all the shoes I love end up in the sale. I'm not sure what that says about my taste but I also don't care as it means cheap shoes for me! 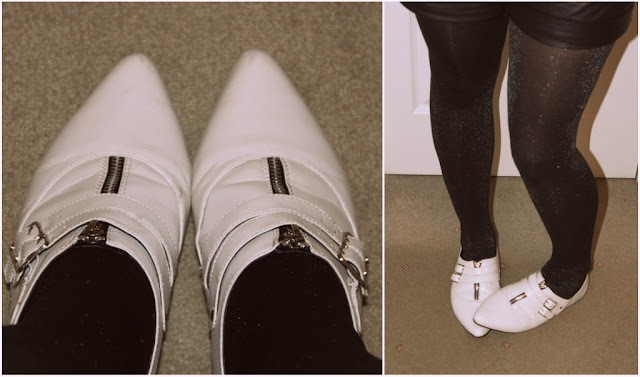 These were £7, reduced from £40, and I'm slightly obsessed with them. 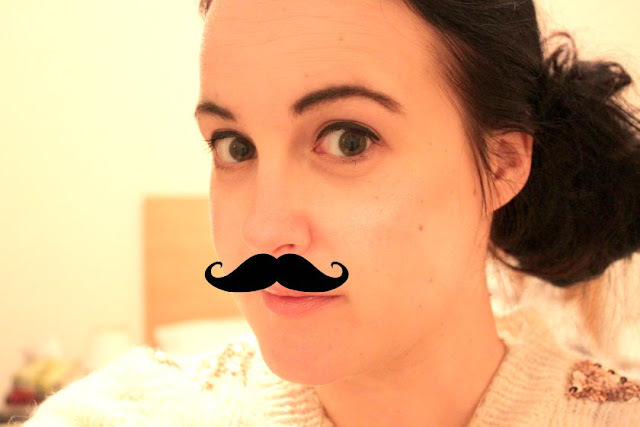 In honour of Movember, here's a horribly overexposed photograph of me with a moustache. LOLZ. In all seriousness, the Prostate Cancer Charity is a cause very close to my heart. I wrote a little bit more about it in this post last year and, if you do have any pennies to spare, please do think about donating it to this wonderful cause.